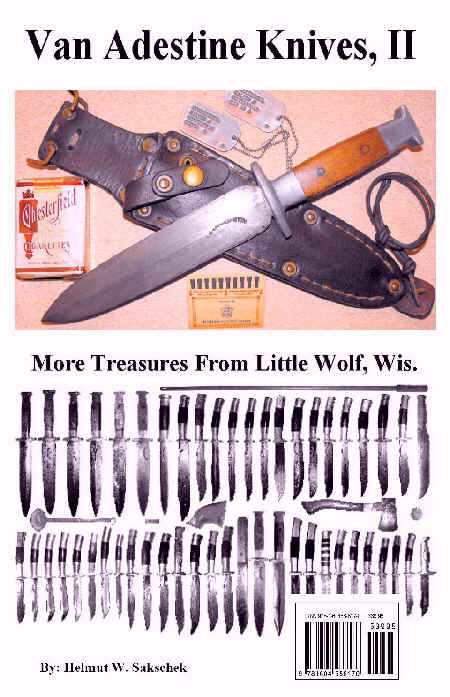 More Treasures From Little Wolf, Wis.
"New Book shows collected Van Adestine items - 50 knives plus more"
The continued research over the 4 years following the first 2008 publishing, has led to the discovery of 32 additional examples of Roberts Van Adestine’s creations. These additions include 30 more knives ( one being made entirely of wood ) and 2 more accessory items that bear his crescent name stamp. The ongoing research also brings a more insightful perspective to Van Adestine’s unsung accomplishes and his unique talents as a pioneering Knife Maker in the early days of the 20th century. 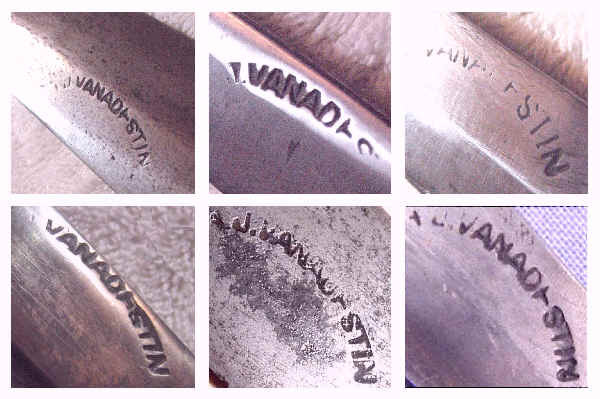 While it is likely a fact that Robert Van Adestine’s name will never come to be as recognized as that of Bill Scagel, Bo Randall, Frank Richtig, Ruanna, or Loveless, his name will nevertheless be included in the conversations among knowledgeable knife collectors discussing those pioneering Knife Makers that left their mark on history. Robert Van Adestine is an unsung knife maker from 1895 - 1959. He and his father before him, made fighting knives for U.S. Soldiers for WWI , WWII , and the Korea War. He made hand forged hunting knives for hunters throughout the U.S.
A complete story about the rare Van Adestine knife has been long awaited. It has taken 7 years of research. This book gives first hand accounts of WWII Soldiers that carried Van Adestine Knives into battle; a B-24 Nose-Gunner stationed in Italy, a Pearl Harbor Survivor, and other WWII Soldiers told their stories to the Author. 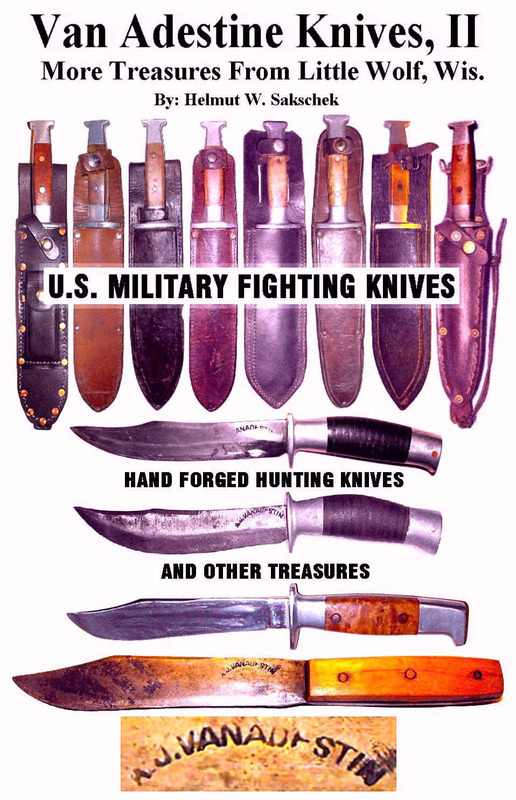 A Collecting Guide and Detailed Study of hand forged U.S. Military Fighting Knives and hand forged Hunting Knives made by Robert Van Adestine, of Little Wolf, Wisconsin. Van Adestine is an unsung knife maker who fabricated knives in a small blacksmith shop located on his farm near Manawa, Wisconsin. 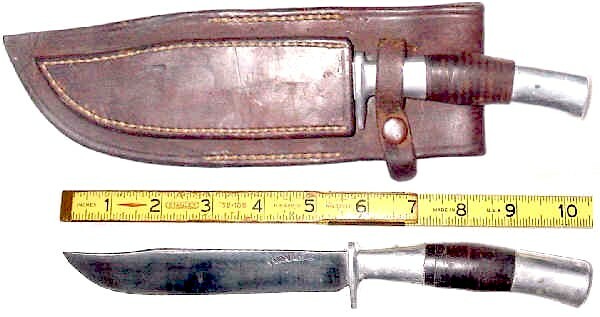 Many of his fighting knives found their way into the hands of U.S. soldiers during WWII either through direct purchase from Van Adestine or through the purchase by caring family members of the soldiers. Van Adestine's knife production spanned over 65 years from about 1894 at age 15 until, his death in 1959. Color Photographs show dozens of examples of his craftsmanship and details of the innovative construction methods he pioneered. Much of the information contained herein is the result of direct interviews with living Van Adestine friends and family. Helmut made a promised to the Family to: "Tell the World about Grandpa Van Adestine's Knives." This book and the one before have fulfilled that promise. Helmut W. Sakschek has been an author / collector since about 1979 with articles appearing in Gun Digest, Handloader's Digest, Guns Illustrated, American Handgunner, Cartridges of the World, and others. Order on-line NOW. Author is autographing and numbering books as orders are received. Limited First Hard Cover Edition. VAN ADESTINE KNIVES, II: More Treasures From Little Wolf Wis.
Mr. Sakschek's article in this month's issue presents us with the perfect opportunity to review his new book, Van Adestine Knives, II - so let's get to it. This book is essentially an updated and greatly expanded version of his 2008 release, Van Adestine Knives. It tells the story of two blacksmith-knifemakers, father Andrew Van Adestine and son Robert Van Adestine, who pursued their trades from the late 1800s up to 1959 in a tiny Wisconsin town by the name of Little Wolf. Andrew was more of a blacksmith and Robert more of a knifemaker; the latter is best known in the collecting world for the dagger-style fighting knives he produced for WWII soldiers, and also for the leather handled, aluminum mounted hunting knives that were sold locally by the maker and nationwide by the upscale Chicago-based sporting goods retailer Von Lengerke and Antoine. VL&A notably sold Van Adestine "Manawa" knives alongside handmade knives by W.W. Scagel and Bo Randall. The new book adds about 80 additional pages and 135 additional photos to what was presented in the initial edition, allowing the author to explore the Van Adestines (particularly Robert, the primary knifemaker) and their knives in even greater detail. Not only has the number of knives presented in the book more than doubled (to fifty examples), but the histories behind some of these newly-discovered knives (and other objects) are also included and add greatly to the book. History has been kind to some pioneering makers like Scagel, Randall, and Ruana; less kind to others. Mr. Sakschek has put forth considerable effort into dragging the Van Adestines out of the dustbin of history, and has done a superb job of it. If you enjoyed the first book, you absolutely must own this one; if you found the article in this issue intriguing and want to learn more about the subject, you'll find Van Adestine Knives, II a fascinating read. VAN ADESTINE KNIVES: Treasures From Little Wolf Wis. Ask a group of collectors about the pioneering knifemakers of the 20th century, and you're likely to hear the same names over and over again - Scagel, Ruanna, Richtig, Morseth, Randall, Moran. But what about Van Adestine? Author Helmut Sakschek hopes to correct an apparent oversight by bringing to the world this new book entitled Van Adestine Knives: Treasures From Little Wolf, Wis. In it, Sakschek reveals the story of father Andrew Van Adestine and son Robert Van Adestine, the former a blacksmith who made knives and the latter a knifemaker who was also an accomplished blacksmith. Robert, the primary knifemaker, made his first knife in 1894 and continued to craft hunting and fighting knives until his death in 1959. The fighting knives, produced during WWII, are already somewhat recognized due to coverage in such books as Wright's Theater Made Military Knives of WWII (pp.145,177), but the hunting knives have remained largely unknown - until now. The World Book Encyclopedia recognized him - a Van Adestine fighting knife was long illustrated under the entry for "dagger" and the maker's knives apparently shared V.L.&A's display space for a time with W.W. Scagel's. Robert even left us a fascinating little anecdote about Scagel... but we'll leave that tidbit for the book to reveal! This book covers everything from the establishment of Little Wolf, Wisconsin and the arrival of the Van Adestines in that place, to in-depth discussions of the maker's methods, standard knife models and one-offs, often in fascinating detail. The book's 50 color and 165 b&w photos include some real gems, including the interior of Van Adestine's shop with knives in progress, the maker with a knife display board, and a great many photos of different knives. Mr. Sakschek has had this book published in a very limited edition of 100 copies in tribute to his late friend Frank Binder, another of the grandchildren of Robert Van Adestine. Much of the information herein was obtained from interviews with the maker's family and friends, capturing bits of history that in many cases would already be gone. While not inexpensive due to the small quantity printed, anyone interested in pioneering American knifemakers of the knives of World War II will find this a fascinating read indeed. But hurry - as these lines are written there are only about 40 copies left, and no present plans for printing more. One of the subjects that never ceases to amaze me is how many early 20th century custom knife makers are practically unknown today. The author of Van Adestine Knives has self-published (limited to 100 copies in the first printing) a compact history of one of those makers from his own part of Wisconsin. R.A. Van Adestine’s shop started hand forging knives sometime in the late 19th century with his son taking over the business in the 20th century. The business seems to have faded out of the picture by the early 1960’s. 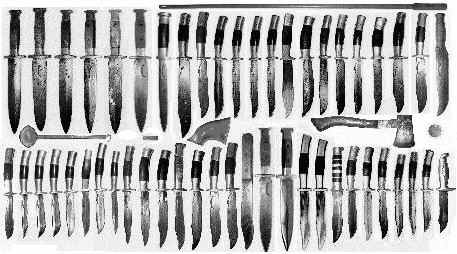 There are several interesting points that can be made about the Van Adestine knives. First, they were made as a side business by a blacksmith, something a well-known cutlery expert claims never happened. Second, they were forged from worn-out files, yet another controversial subject. Third, they utilized a cast aluminum handle frame with handle inserts much like those found on Ruana knives. And possibly the most interesting bit of trivia is that either Bill Scagel copied the Van Adestine combat knife or the Wisconsin maker copied him. The Van Adestine family feels it was the latter and offers fairly convincing proof. The once famous Chicago outdoor store, Von Lengerke & Antoine (part of Abercrombie & Fitch), sold the Van Adestine knives through their mail-order catalog so these rare blades can turn up about anywhere. They are certainly collectables worth keeping an eye open for. All rights reserved. No part of this book shall be reproduced, stored in a retrieval system, or transmitted by any means without written permission from the author.